Acclaimed musical JERSEY BOYS returns to Bass Hall February 12-17! Performing Arts Fort Worth welcomes back the Tony-, Grammy- and Olivier Award-winning hit Broadway sensation JERSEY BOYS, the story of Frankie Valli and The Four Seasons, to Bass Performance Hall February 12-17, 2019. Tickets start at $44 and are on sale now! Written by Academy Award® -winner Marshall Brickman and Rick Elice, with music by Bob Gaudio, lyrics by Bob Crewe and choreography by Sergio Trujillo, JERSEY BOYS is the behind- the-music story of Frankie Valli and The Four Seasons. They were just four guys from Jersey, until they sang their very first note. They had a sound nobody had ever heard… and the radio just couldn’t get enough of. But while their harmonies were perfect on stage, off stage it was a very different story – a story that has made them an international sensation all over again. The cast of JERSEY BOYS will be led by Jonathan Cable (Nick Massi), Eric Chambliss (Bob Gaudio), Corey Greenan (Tommy DeVito) and Jonny Wexler (Frankie Valli) as The Four Seasons. The ensemble of JERSEY BOYS includes Ashley Bruce, Tony L. Clements, Rick Desloge, Wade Dooley, Todd DuBail, Caitlin Leary, Kevin Patrick Martin, Jeremy Sartin, Chloe Tiso, Kit Treece and Jessica Wockenfuss. Directed by two-time Tony® Award-winner Des McAnuff, JERSEY BOYS won the 2006 Tony® Award for Best Musical, the 2006 Grammy Award® for Best Musical Show Album, the 2009 Olivier Award for Best New Musical and the 2010 Helpmann Award for Best Musical (Australia). The show opened in New York on November 6, 2005 and by the time it closed over 11 years later, on January 15, 2017, it was the 12th longest running show in Broadway history, passing such original Broadway productions as 42nd Street, Grease, Fiddler on the Roof and The Producers. The JERSEY BOYS U.S. National Tour opened to rave reviews in San Francisco on December 1, 2006 and is still breaking house records in cities across North America. To charge tickets by phone, call (817) 212-4280 in Fort Worth; 1-877-212-4280 (toll free) outside Fort Worth; or order online at http://www.basshall.com. Tickets are also available at the Bass Performance Hall ticket office at 525 Commerce Street. Ticket office hours: Monday through Friday 10:00 a.m. – 6:00 p.m. and Saturday 10:00 a.m. – 4:00 p.m. For group sales call (817) 212-4248 or email groupsales@basshall.com. 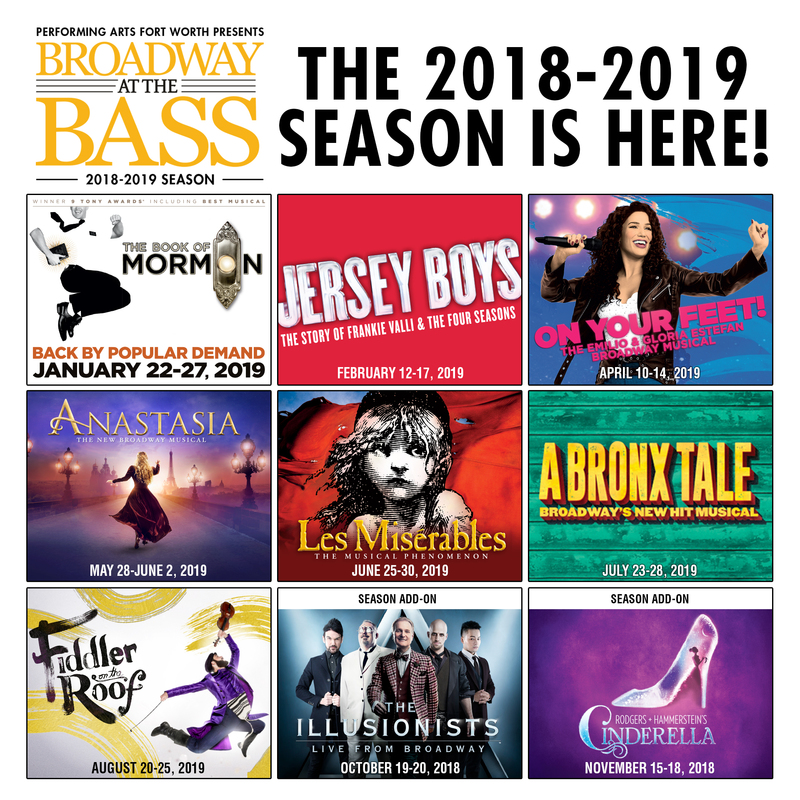 Previous Previous post: HAMILTON to anchor 2019-2020 Broadway at the Bass season!